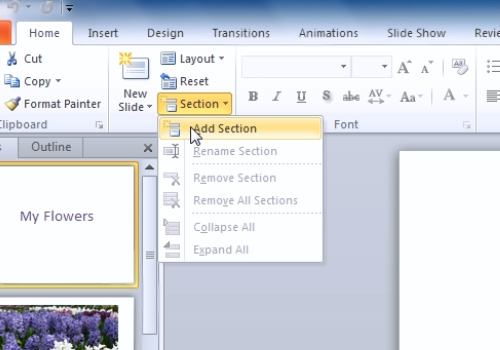 In this video tutorial we will show you how to group PowerPoint slides. 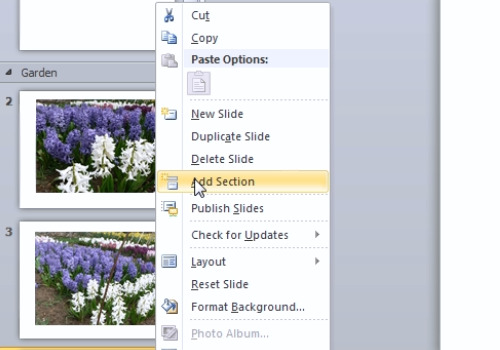 Launch the PowerPoint and open the previously prepared presentation file. Select “Home” tab and click on the first slide thumbnail. Then select the “Section” menu and press on the “Add Section” button. Click on the appeared section label by clicking the right mouse button and select “Rename Section” in the dropdown menu option. Type the section name in the opened window and press “Rename” button. Move on to the starting slide of the section at the slides in the preview panel. Right clicking on the desired slide. Then select the “Add Section” tab. When a new section label appears, right click on it and select “Rename Section” option from the dropdown menu. 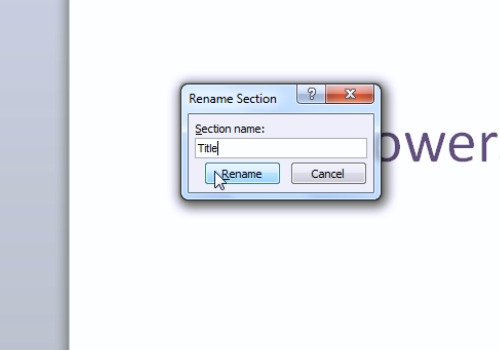 Type the section name in the opened window and press “Rename” button. Repeat these actions until all needed sections are created successfully. It can be useful to collapse sections of long presentations.